To quote our favorite X-Files FBI agent, Fox Mulder: “Well, I got a new theory. I say that when zombies try to eat people, that's just the first stage. You see, they've just come back from being dead so they're going to do all the things they miss from when they were alive. So, first, they're going to eat, then they're going to drink, then they're going to dance and make love.”* Norwescon 33 is going to prove Mulder’s theory. Thursday is all about zombies. Special Events is bringing you a night filled with them, so many of them you may think it is a zombie holocaust. It starts during the day with two classes to teach our zombies to dance. Anyone who wants to learn the Thrill the World version of Michael Jackson’s Thriller dance should come to one of the afternoon panels in Maxi’s Ballroom. Whether dancing is your thing or not, we encourage you to bring your best zombie face to our 8PM Zombie 101 panel, also affectionately known as Walk, Zombie, Walk! Here we will teach you how to shamble, drool, swing your arms and groan like the zombie you long to be. There will be people available to help you join the undead invasion if you haven’t already zombified in advance. 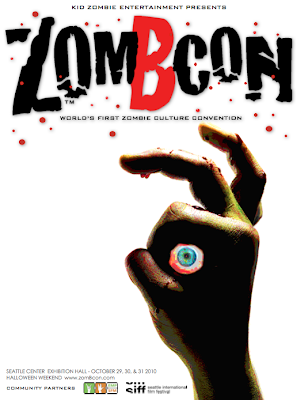 Zombie 101 will leave you hungry and eager to spread your infectious virus in the 1st Norwescon Zombie Walk. The 1st Norwescon Zombie Walk gathers in Grand 2 at 9PM and starts shambling through the halls around 9:20PM. The walking dead will crawl through the hotel and end their hunt for chow in the Tour of a House of Horrors dance where the siren call of Michael Jackson’s Thriller will overwhelm them and they will dance! At the dance you can eat (always ask first), drink and dance, but we at Norwescon can only do so much, the making love part is up to you. Good luck and watch out for those snipers, head shots bite. On Thursday you can EAT A BRAIN FOR CHARITY! For a donation to the Norwescon charity drive (this year our charities are Northwest Harvest and Clarion West) you will get half a brain and a ribbon that says “I ate a Brain for Charity” These will be available at the Info Table in the lobby. If you want to get your own brain to eat for charity, you will have to do it before 6pm when the Info Table closes. On October 26, 2009, a record-breaking 22,596 people worldwide participated in the 4th annual Thrill the World event, a simultaneous dance to Michael Jackson's “Thriller.” The steps, while true to the famous music video, are slightly different, and cover the entire 5 minute 58 second song. Anyone in reasonable shape can learn this dance! Its okay if you’re a little awkward – hey, you’re a zombie! Dress comfortably and wear shoes you can dance in. Two sessions are scheduled; you are welcome to attend both if you want, but we will teach the entire dance in each session. At the end of Thursday evening’s zombie walk, you may join in as we perform for the crowd at the dance! Shamble yourselves down to Grand 2 to learn what it takes to be a zombie. Our zombie pros will teach you how to move, think, and act like a zombie. There will also be people available to apply basic zombie makeup to help you achieve that zombie feel. Wear old clothes and get in the spirit, because this is the start of the 1st Norwescon Zombie Walk. Feel free to come already zombified. Join us here to be a part of the 1st Norwescon Zombie Walk to take over the halls of the Doubletree. Zombies will shamble around the con, ending up in the dance where they can take part in the Thrill the World zombie dance to Michael Jackson's entire "Thriller" song. Please see the earlier panels today that will be teaching the Thrill the World dance if you wish to learn it in advance. Join us for Tour of a House of Horrors as DJ Irah hosts a night of frights and delights. Watch out for zombies on the dance floor as they "thrill" us with their moves, dancing to music from back in the day up to today's hottest hits.